Calumet Farm’s multiple graded stakes-placed Bravazo has danced in all of the major dances of 2018 including all three legs of the Triple Crown, the Haskell Invitational (Grade I), Travers Stakes (GI) and the Breeders’ Cup Dirt Mile (GI). 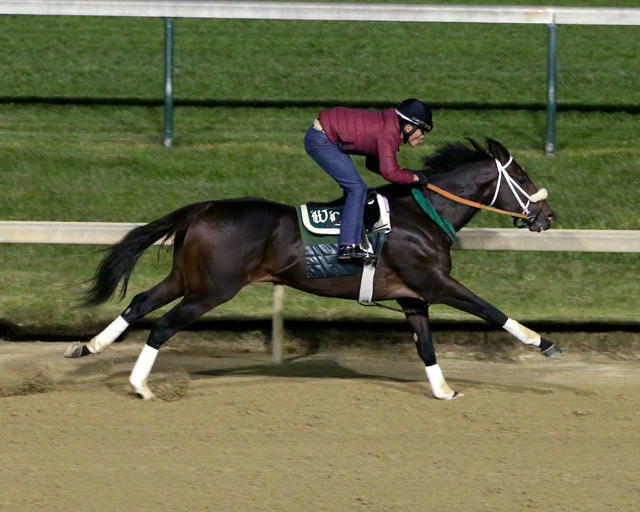 But Hall of Fame trainer D. Wayne Lukas believes the 3-year-old colt could be improving at the right time ahead of Saturday’s $500,000 Clark Handicap Presented by Norton Healthcare (GI) at Churchill Downs. “Believe it or not, I think this horse is actually getting better with each start,” Lukas said. “I don’t think the one-mile distance was his best in the Breeders’ Cup but I thought the (Dirt Mile) was the better option instead of the Classic. I think the extra distance in the Clark will suit him great. The 3-year-old colt by Awesome Again will attempt to give Lukas a record-tying third win in the race after previously winning with Will Take Charge (2013) and Surfside (2000). Both of Lukas’ previous winners were 3-year-olds that cemented year-end divisional championship honors. Bravazo finished third in the Nov. 3 Dirt Mile, 2 ½ lengths behind runner-up Seeking the Soul, who is listed as the 8-5 morning line favorite in the Clark. The Calumet homebred’s campaign was highlighted by runner-up finishes in the Preakness (GI) and Haskell and a third-place effort in the Travers. The three-time winner will have the riding services of Joel Rosario in the Clark Handicap, who was assigned 118 pounds and is 9-2 on Mike Battaglia’s morning line odds. The complete Clark Handicap field from the rail out (with jockey, trainer, assigned weight and morning line odds): Prime Attraction (Kent Desormeaux, James Cassidy, 120 pounds, 3-1); Hence (Ricardo Santana Jr., Steve Asmussen, 118, 12-1); Seeking the Soul (John Velazquez, Dallas Stewart, 123, 8-5); Hawaakom (Joe Rocco Jr., Wes Hawley, 116, 15-1); Leofric (Florent Geroux, Brad Cox, 121, 3-1); Bravazo (Rosario, Lukas, 118, 9-2); Storm Advisory (Albin Jiminez, Anthony Quartarolo, 114, 30-1); and Sightforsoreeyes (Tyler Gaffalione, Quartarolo, 115, 30-1). One race prior to the Clark, Pebbles Stakes winner Stella di Camelot (IRE) was made the 2-1 morning line favorite for the 28th running of the $200,000 Mrs. Revere (GII). Stella di Camelot previously ran in France with Gianluca Bietolini prior to her being transferred to trainer Chad Brown’s care in the spring. The complete field for the Mrs. Revere, run at 1 1/16 miles on the Matt Winn Turf Course, from the rail out (with jockey, trainer and morning line odds): Lessons From Avery (Edgar Morales, Charlie LoPresti, 30-1); High Tech (Chris Landeros, Ian Wilkes, 15-1); Angel of Mischief (Tyler Gaffalione, Norm Casse, 15-1); Kabella (Declan Cannon, Danny Peitz, 20-1); Cool Beans (Florent Geroux, Brad Cox, 4-1); Princess Warrior (Brian Hernandez Jr., Kenny McPeek, 7-2); Over Thinking (Corey Lanerie, Vicki Oliver, 20-1); Get Explicit (Ricardo Santana Jr., Barbara Minshall, 6-1); Divine Queen (Calvin Borel, Buff Bradley, 20-1); Stella di Camelot (IRE) (Joel Rosario, Brown, 2-1); Arabella Bella (Albin Jiminez, Mikhail Yanakov, 50-1); and Dark Artist (Trevor McCarthy, Jane Cibell, 8-1). All jockeys are assigned 118 pounds. BREEDERS’ CUP JUVNEILE SECOND KNICKS GO 2-1 MORNING LINE KENTUCKY JOCKEY CLUB FAVE – The Breeders’ Cup Juvenile (Grade I) runner-up Knicks Go was made the slight 2-1 morning line favorite as he faces 13 promising 2-year-old rivals that were entered for Saturday’s 92nd running of the $200,000 Kentucky Jockey Club (GII) at Churchill Downs. The 1 1/16-mile race is the co-headliner on the penultimate day of the 21-date Fall Meet. Billed as “Stars of Tomorrow II,” each of the 12 races is exclusively for 2-year-olds that may have aspirations of trail-blazing their way to next spring’s Kentucky Derby Presented by Woodford Reserve (GI) and Longines Kentucky Oaks (GI). Knicks Go, a speedy son of Paynter, led wire-to-wire in the Oct. 6 Breeders’ Futurity (GI) at Keeneland at odds of 70-1. The Maryland-bred, owned by KRA Stud Farm and trained by Ben Colebrook, finished 2 ¼ lengths behind the Bob Baffert-trained Game Winner in the Breeders’ Cup Juvenile at odds of 40-1. One of Colebrook’s targets for Knicks Go was the Dec. 4 Marylander at Laurel Park but the 40-year-old conditioner opted to enter the colt in Saturday’s race. Jockey Albin Jimenez has the return call and will break from post position 13. “We decided to just keep him home for this race and this could be his final start before the (Feb. 9) Sam F. Davis (GIII),” Colebrook said. Chief among Knicks Go’s competitors in the Jockey Club is Breeders’ Cup Juvenile third-place finisher Signalman, who is the 5-2 second choice on the morning line for owners Tommie Lewis, David Bernsen and Magdalena Racing and trainer Kenny McPeek. Signalman finished one length behind Knicks Go in the Juvenile after breaking from post 14 and rallying from 10 lengths off the early pace. The complete field for the Kentucky Jockey Club from the rail out (with jockey, trainer and morning line odds): Signalman (Hernandez, McPeek, 5-2); Tracksmith (Adam Beschizza, Joe Sharp, 20-1); Manny Wah (Channing Hill, Wayne Catalano, 20-1); Dunph (Tyler Gaffalione, Mike Maker, 6-1); Plus Que Parfait (Julien Leparoux, Brendan Walsh, 20-1); Blue Steel (Robby Albarado, Dale Romans, 15-1); Limonite (Ricardo Santana Jr., Steve Asmussen, 20-1); Royal Urn (Leonel Reyes, Michelle Nihei, 30--1); Current (Javier Castellano, Todd Pletcher, 15-1); Roiland (Edgar Morales, Tom Amoss, 20-1); Mick’s Star (Corey Lanerie, Amoss, 30-1); King for a Day (John Velazquez, Pletcher, 8-1); Knicks Go (Jiminez, Colebrook, 2-1); Topper T (Florent Geroux, Bill Mott, 20-1). Also Eligible should any early scratches occur: Everfast (Albarado, Romans, 30-1); and Kentucky Allstar (Santana, Maker, 30-1). All riders are assigned 122 pounds. Inaugurated in 2005, Churchill Downs’ “Stars of Tomorrow” programs have helped launched the careers of numerous graded stakes winners, including more than 50 future Grade I winners led by Horse of the Year and Breeders’ Cup Classic winner Gun Runner; 2011 Preakness and 2012 Met Mile and Clark Handicap winner Shackleford; 2009 Horse of the Year Rachel Alexandra; 2012 Breeders’ Cup Classic and 2013 Stephen Foster Handicap hero Fort Larned; 2012 Kentucky Oaks winner Believe You Can; 2013 champion 3-year-old Will Take Charge; and 2016 Belmont Stakes winner Creator. BREEDERS’ CUP JUVNEILE FILLIES RUNNER-UP RESTLESS RIDER 7-5 GOLDEN ROD FAVORITE – Three Chimneys Farm and Fern Circle Stables’ Breeders’ Cup Juvenile Fillies (Grade I) runner-up Restless Rider will challenge seven 2-year-old fillies as the 7-5 morning line favorite in Saturday’s 75th running of the $200,000 Golden Rod (GII) at Churchill Downs. Restless Rider, a grey daughter of Distorted Humor, finished 5 ½ lengths behind wire to wire winner Jaywalk in the Juvenile Fillies. Trained by Kenny McPeek, Restless Rider scored an ultra-impressive 11 ¼ length win in the Debutante Stakes in late June at Churchill Downs and a 2 ½-length score in the Alcibiades (GI) at Keeneland in October. The field for Golden Rod from the rail out (with jockey, trainer and morning line odds): Gold Credit (John Velazquez, Ignacio Correas IV, 8-1); High Regard (Corey Lanerie, Vicki Oliver, 15-1); Reflect (Tyler Gaffalione, Keith Desormeaux, 12-1); Champagne Anyone (Chris Landeros, Ian Wilkes, 10-1); Restless Rider (Hernandez, McPeek, 7-5); Liora (Channing Hill, Wayne Catalano, 12-1); Princess Causeway (Julien Leparoux, Wilkes, 8-1); Break Curfew (Javier Castellano, Chad Brown, 9-5). MEET LEADERS – With four days remaining in the Fall Meet at Churchill Downs, Edgar Morales held a 17-15 win lead over Spring Meet leading rider Brian Hernandez Jr. Jockeys Tyler Gaffalione and Corey Lanerie were tied for third with 12 wins. … Trainer Dallas Stewart held a narrow 8-7 win lead over Steve Asmussen. Brad Cox, Kenny McPeek and Ian Wilkes were tied for third with six wins. Stewart is in search of his first training title at Churchill Downs. … G M B Racing and Loooch Racing Stables were tied atop the owner’s standings with four wins each. Juddmonte Farms and Alex and JoAnn Lieblong were tied for third with three victories. DOWN THE STRETCH – There was a $188,386 carryover in the 20-cent Single 6 Jackpot to begin Thursday’s card. The Single 6 sequence began in Race 7 at 2:24 p.m. … Trainer Dale Romans began Thursday four wins away from 2,000 career victories and had 15 entries Thursday-Saturday. ... Friday there will be a special merchadise sale on the backstretch of Churchill Downs that will feature Triple Crown jackets, hats, tee shirts and more from 70-80 percent off retail value. The sale will occur from 8 a.m. - noon on the basketball court near the Recreation Hall.